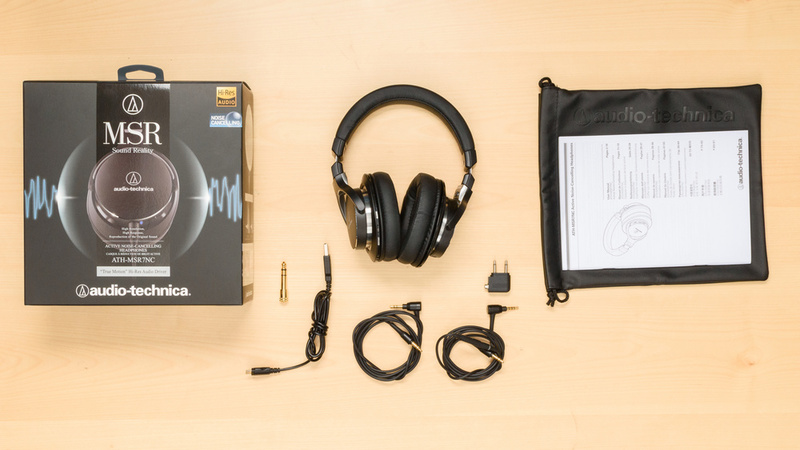 The Audio-Technica ATH-MSR7NC are well-built and sturdy headphones with a well-balanced sound. They're comfortable and do not leak much at high volumes. 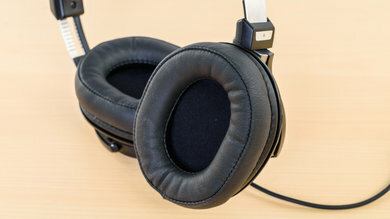 However, they don't block a lot of noise despite being noise canceling headphones, so they're not the best option for traveling or commuting. They're also a bit too bulky for sports, but they deliver a good audio reproduction for critical listening. Poor noise isolation especially for noise canceling headphones. The ATH-MSR7NC are the most high-end-looking audio-Technica headphones that we've reviewed so far. They have an excellent build quality that feels sturdy, durable and makes use of premium materials. 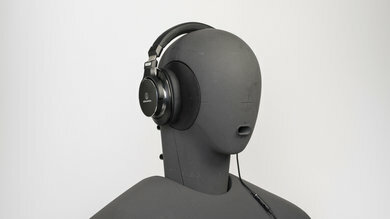 They're also comfortable with better padding on the headband and the ear cups compared to the rest of the ATH-M series. Unfortunately, they're not very portable headphones. They're too bulky for sports and have a slightly disappointing control scheme. They also have a rather basic carrying pouch for their price range. The MSR7NC have a similar look and feel to the rest of the ATH-M series but are considerably better built. They look high-end and feel sturdy when you pick them up. They have a decently thick headband and large circular ear cups that are amply padded. If you liked the designs of most of the ATH-M lineup, then the MSR7NC will look even better thanks to their more premium appeal. However, they still have a somewhat studio vibe, so they won't be a flashy fashion statement to go with your outfit. The MSR7NC are comfortable over-ear headphones. They're bit bulkier than the typical M series lineup, but they're not uncomfortably heavy. 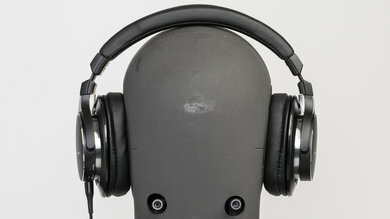 They have thicker padding and deeper earcups than the ATH-M70x or ATH-M50x. However, the headband does not extend far enough so they may feel a little tight on some heads. The MSR7NC have an average control scheme that's easy to use but lacks volume controls. They only have one button on the inline remote for calls, pausing and playing audio as well as track skipping. 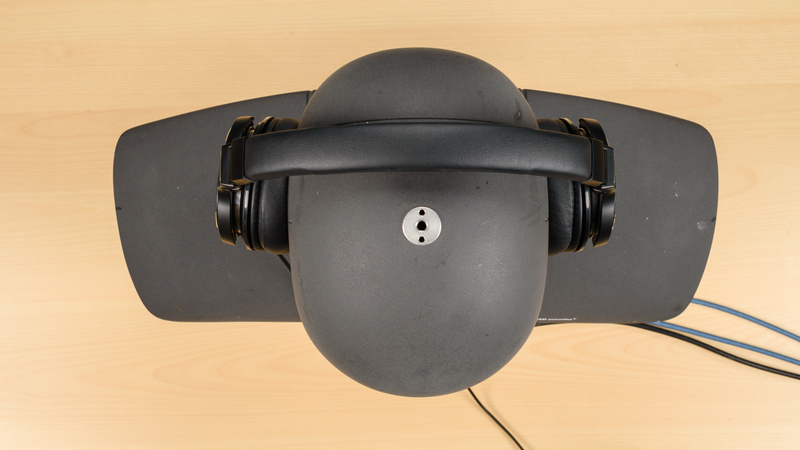 On the ear cup, there's an on/off switch for the noise cancellation. The buttons are quite responsive and straightforward but the lack of volume controls feels limiting. The MSR7NC are decently large over-ear headphones which unlike some of the other headphones in the ATH-M series, do not fold into a more compact format. The ear cups lay flat to save a bit of space, but they're too bulky and cumbersome to comfortably carry around on your person without a bag. 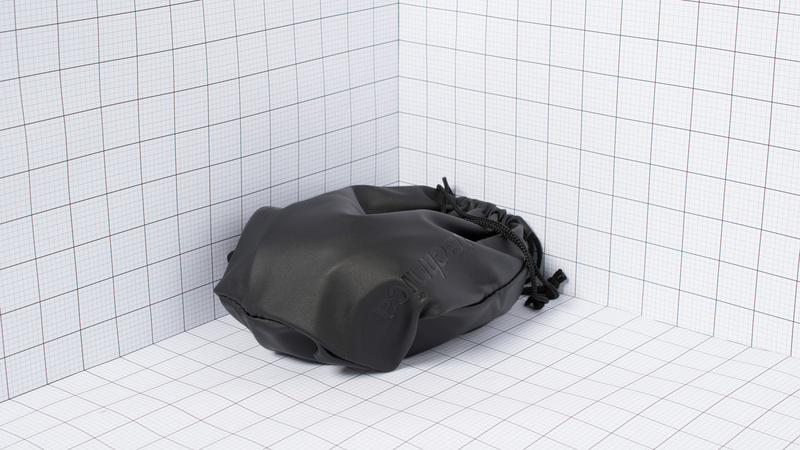 Comes with a cloth pouch that will protect the headphones against minor scratches if you put them in your bag. Unfortunately, the soft pouch won't shield them from drops impacts and water exposure which is disappointing given the price range and level of care put into the design of the MSR7NC. 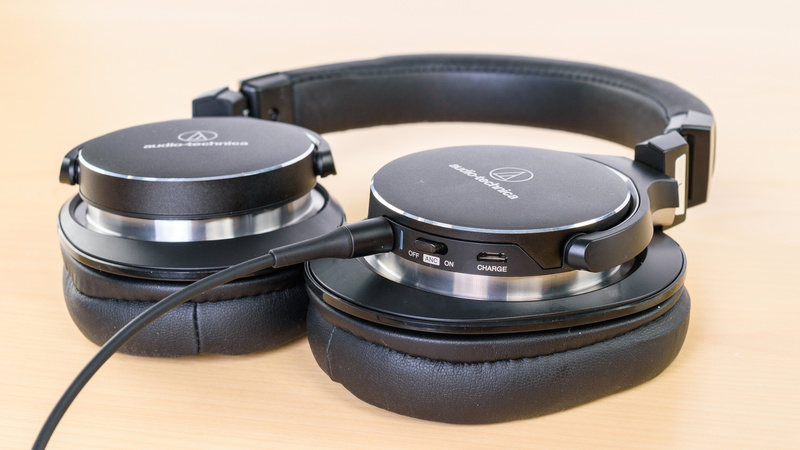 The ATH-MSR7NC have a great build quality that feels durable and high-end. The headband is thick and reinforced with a plastic and metal frame. The ear cups are dense and won't get damaged from accidently dropping the headphones. The cables are also thick and detachable, which means these headphones should be able to withstand regular wear and tear pretty well. The MSR7-NC are tight enough to be stable during casual use but won't be the ideal headphones for running or working out. The earcups sway a lot during physical activities and may slip off your ears. On the upside, the cable is detachable, so it will disconnect if it gets hooked on something. 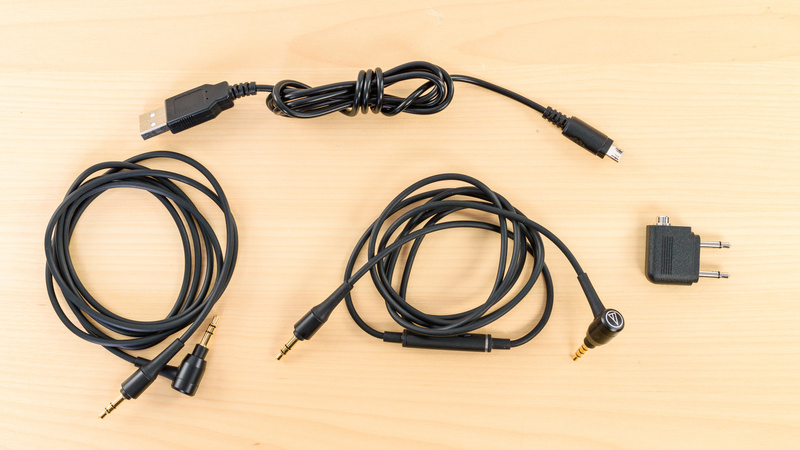 Comes with 3 cables; A 1/8"TRS-TRRS audio cable with an inline remote, a 1/8"TRS-TRS regular audio cable and a USB charging cable. 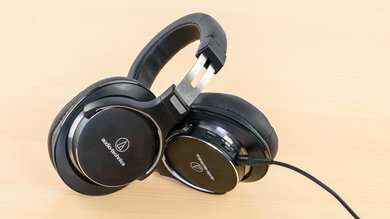 The Audio Technica ATH-MSR7NC are a good sounding pair of closed-back over-ear headphones. They have an excellent and extended Bass, a very good Mid Range, a very good Treble Range, and low distortion. 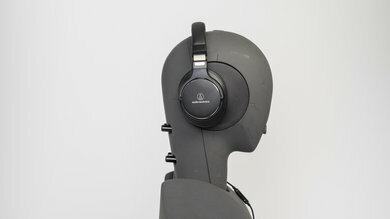 However, their Bass Range is susceptible to inconsistencies, and if you wear glasses, there's a chance you may not be getting all the Bass that these headphones are capable of producing. Also, like most other closed-back active noise cancelling headphones, the MSR7 won't have the most open and spacious Soundstage. Excellent Bass Range performance. Low-bass is extended down to 13Hz, which is great. However, low-bass, which is responsible for thump and rumble is lacking by about 2dB. Bass is well-balanced and nearly flawless. High-bass is over our target by about 2dB, adding just a little bit of boominess to the sound. Also, their bass delivery varies significantly across users, and is sensitive to the quality of fit, seal, and whether you wear glasses. The response here represents the average bass response and your experience may vary. Very good Mid Range performance. Low-mid has 1dB of dip around 400Hz, thinning out vocals/leads. But at 1dB, the effect will be barely noticeable. Mid is reproduced nearly flawlessly and is within 0.5dB of our target. High-mid is overemphasized by about 3dB, adding excess intensity and projection to vocals/leads. Very good Treble Range performance. The 2dB bump in low-treble, which is the continuation of the high-mid overemphasis adds to the detail and articulation of vocals/leads. 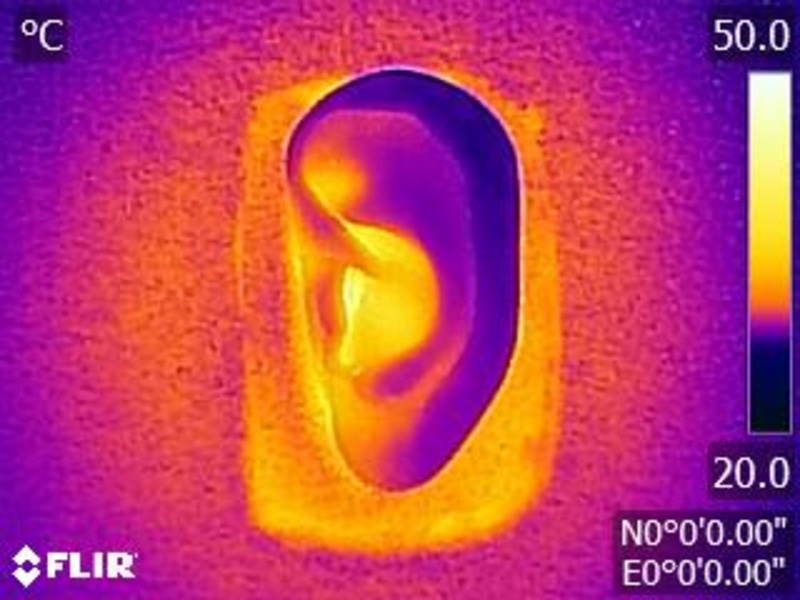 Treble is within 0.8dB of our target, but the peak at 10KHz could make them slightly sibilant to those with overly sensitive ears. Sub-par consistency performance. The Bass Range response is susceptible to consistencies due to head shape/size and also the presence/absence of glasses. 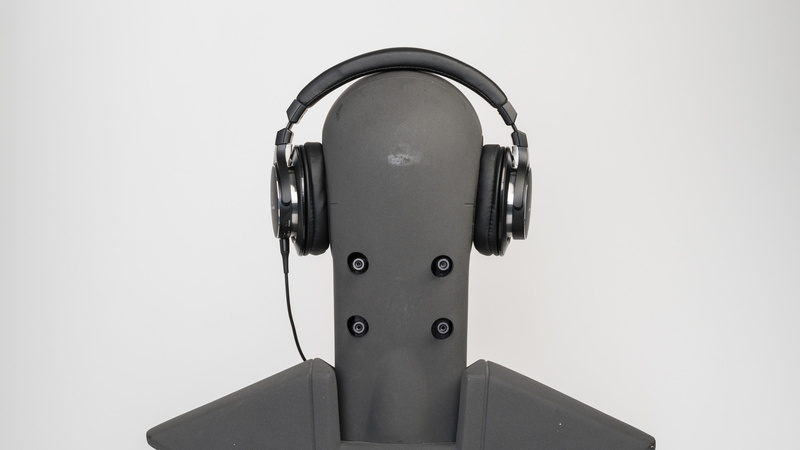 Our human subject who wears glasses loses 3dB of Bass starting at 300Hz which is quite significant. The Treble Range consistency is also mediocre, with a deviation of +/-3dB at 3KHz. Very good Harmonic Distortion performance. The overall amount of harmonic distortion is low, even at 100dB SPL, which is good. The rise in distortion under heavier loads is also minimal and happening mostly in the Mid Range which is also good. The MSR7NC do not have the best noise cancellation. 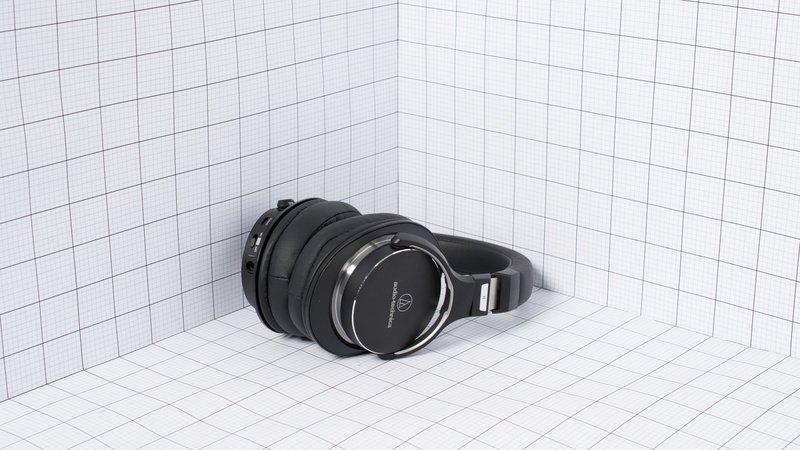 They isolate fairly well against high-frequency noise like most passive headphones, but their active noise cancellation is a little weak and lets the rumbles and chatter of a busy commute seep into your audio. On the upside, they're not very leaky headphones, so at higher volumes, they won't be as distracting to the people around you like some of the other ATH-M headphones. Sub-par Isolation. 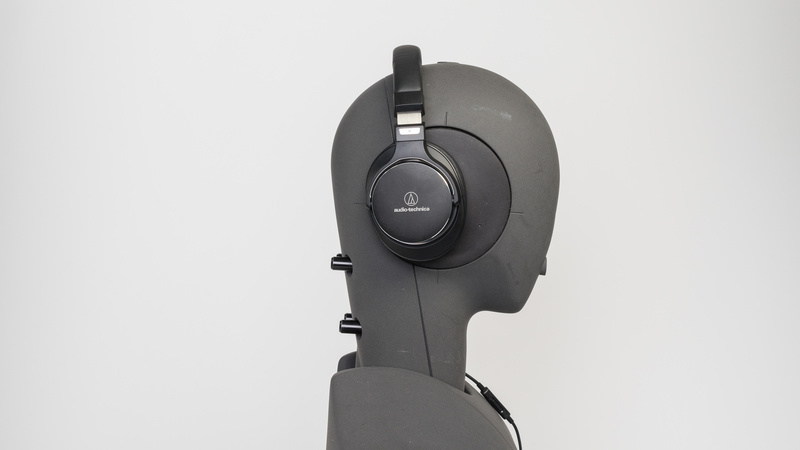 The noise-cancelling system of these headphones kick-in at around 50Hz and are effective up to 1KHz. They achieve about 5dB of isolation in the Bass Range which is sub-par. In the Mid Range, the reduce the outside noise by about 8dB, which is about average. However, in the Treble Range, they achieve more than 30dB of isolation which is good. Good Leakage performance. The significant portion of Leakage sits between 400hz and 7KHz, which is a relatively broad range. However, the overall level of leakage is quite low. 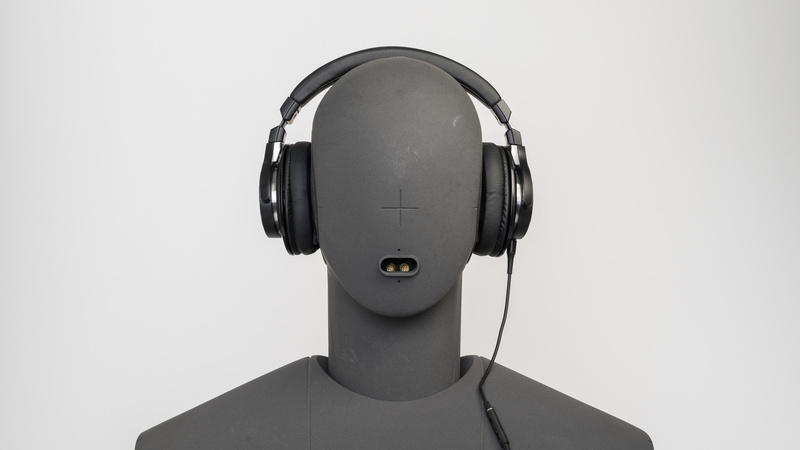 The ATH-MSR7NC are straightforward, wired, noise canceling headphones. They do not have any wireless features or a compatible app to customize their sound. However, since they're wired they have no latency when watching videos but do not have the range of most wireless headphones. On the upside, they provide up to 27 hours of continuous playback when the ANC is enabled but take quite a bit of time to charge. These headphones have up to 27 hours of continuous playtime at average volumes, which is great for long flights or road trips. Unfortunately, they take quite a bit of time to charge and they do not have any battery saving features like an auto-off timer. On the upside, they can be used completely passively when the batteries die and can charge while continuously playing audio. The MSR7NC are decent mixed usage headphones with a good sound. They won't be the ideal headphones for commuting despite being noise canceling headphones and they may be a bit too bulky for sports. On the upside, they have a good sound, a great build quality and a polished design that will appeal to casual and serious listeners. Good for critical listening. They're comfortable enough to wear for hours and have well-balanced sound. Their bass extends into the lower frequencies, which gives a good kick without being overpowering, so you can still clearly distinguish instruments and vocals. However, there's a slight bump in the high-mid/low-treble that may push instruments a bit too forward on some tracks which could sound a bit harsh. 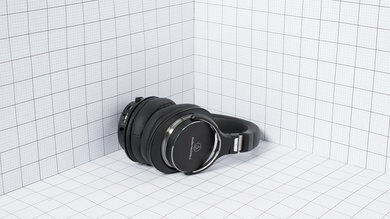 They also do not have a wide soundstage due to their closed-back noise-canceling design, but overall they sound good enough for both casual and more critical listeners. Mediocre for commuting. 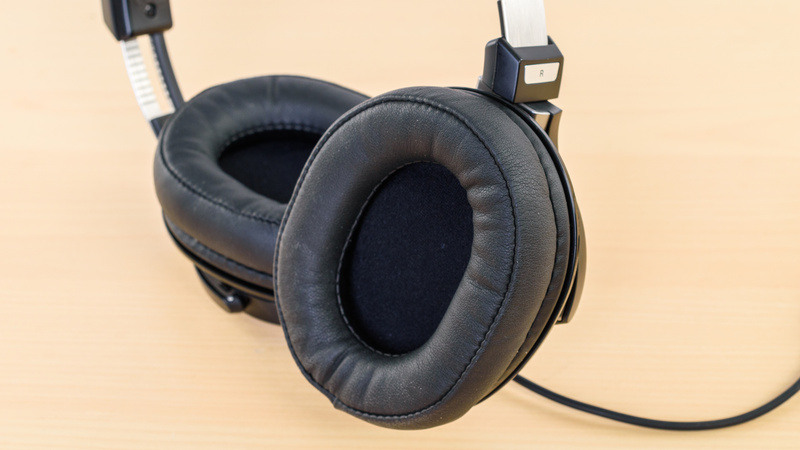 They have a comfortable fit but a mediocre control scheme and a subpar noise cancellation performance., They may be able to mask some noise if you're playing at high enough volumes, but they won't be the ideal headphones for loud environments. Mediocre for sports. They have an easy to use but limited control scheme. Unfortunately, they're a bit too bulky and cumbersome for sport. They also create a pretty good seal around your ears which means they won't be the most breathable headphones to run with. Above-average for home theater use. They have a decent sound, and they're somewhat comfortable. They're also wired, so they have no latency when watching videos, but the cable may not be long enough for you to comfortably watch movies from your couch unless you have an audio cable extension.